The HD67020 and HD670021 are M-Bus / RS232 - Converter (transparent converter). This series allow to read/write M-Bus Slaves devices by RS232, ensuring galvanic isolation between M-Bus and RS232. 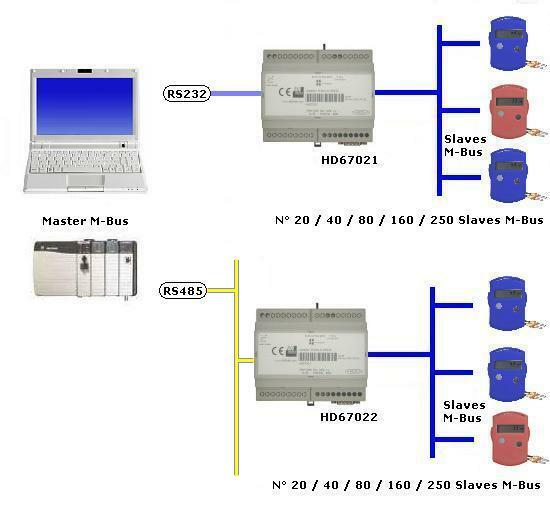 HD67020 are Plug&Play devices and they allow to connect up to 10 M-Bus Slaves to RS232. HD67021 are Configurable devices with Logic Inside and they allow to connect up to 250 M-Bus Slaves to RS232. The HD67022 are M-Bus / RS485 - Converter (transparent converter). This series allow to read/write M-Bus Slaves devices by RS485, ensuring galvanic isolation between M-Bus and RS485. HD67022 are Configurable devices with Logic Inside and they allow to connect up to 250 M-Bus Slaves to RS485. The HD67018 are M-Bus Slave / Serial - Converter (transparent converter). 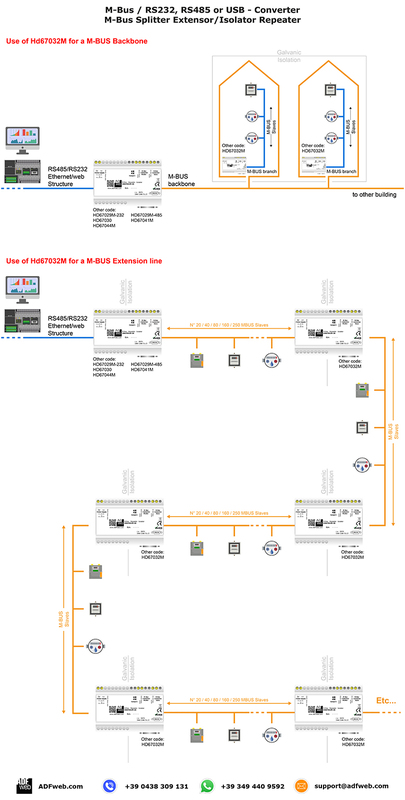 This series allow to read/write M-Bus Slaves devices on RS485 (like Caleffi meters etc..) with a Standard M-Bus Master (M-Bus physical layer). The HD67024 are M-Bus / USB - Converter (transparent converter). This series allow to read/write M-Bus Slaves devices by USB, ensuring galvanic isolation between M-Bus and USB. HD67024 are Configurable devices with Logic Inside and they allow to connect up to 250 M-Bus Slaves to USB. The HD67032 are M-Bus Splitters Repeaters, this serie allows to Isolate and Extend a M-Bus Line, ensuring galvanic isolation between the various M-Bus branches. HD67032 are Configurable devices with Logic Inside and they allow to connect up to 250 M-Bus Slaves.